Duo Hellqvist/Amaral. Foto: Ellen Inga. Violinist Karin Hellqvist and pianist Heloisa Amaral met in 2009 while working in Oslo with Ensemble neoN. Two years later, they set off exploring Iannis Xenakis’ Dikthas (or “dual”) for violin and piano. Featuring two contrasting voices held together through intense energy, the piece was to determine the spirit of Duo Hellqvist/Amaral, which, shortly after, made their debut concert at the Ultima Oslo Contemporary Music Festival. Fearless in their exploration of the newest music, the duo has since played an outstanding role in the field of experimental music . Alongside the performance of new commissions by composers Øyvind Torvund, Marina Rosenfeld, Dror Feiler, Natasha Barrett, Mauricio Pauly, Santiago Diez-Fischer et al. in Norway (Ultima, Borealis), Sweden (Magnet, Sofiagatan), USA (Spectrum), Germany (Darmstädter Ferienkurse, KontraKlang Berlin), Brazil, Iceland, Italy, Argentina (conDIT), Danmark (Klang), Korea (House Concert) and Colombia (Festival de la Imagen), the duo has given workshops and seminars in major universities in Latin America, USA, Argentina and Korea focusing on the interpretation, notation and technical realization of experimental repertoire as well as on the dialogue between performer and composer. Stimulating musical encounters with other performers during residencies at Harvard University (USA), conDIT (ARG), House Concert (KO) and Villa Romana (IT) have led to the formation of the neoN Trio with Yumi Murakami (flute) in 2012, the HAHB QUARTET in 2014 and TRIO HELLQVIST/CHOI/AMARAL with Sori Choi (traditional Korean percussion) in 2015. Recently, the duo has initiated a collective project, Impossible Situations/A Collective Experiment, in which a a sound director (Max Sauer), an architect (Filippa Berglund) and group of composers including Øyvind Torvund, Marina Rosenfeld, Kaj Duncan David, Lars Petter Hagen, Ricardo Eizirik, Ida Lundén, Cathrine Lamb, Simon Loeffler et al., work closely with the performers to create, out of the intimacy of the chamber music situation, utopian spaces that expand instrumental, performative, mediatic and scenic boundaries as well as the very role of the performers. Other upcoming projects include new commissions by among others Ragnhild Berstad, Dror Feiler, Daniel Moreira, Jorge Sanchez-Verdu and Alberto Bernal and concerts at Borealis Festival (NO), CentroCentro and Mixtur (SPA) in 2018. For a FULL LIST OF REPERTOIRE click here. For CURRENT PROJECTS or WORKSHOPS & SEMINARS click here. With profound engagement in the music of today, Swedish violinist Karin Hellqvist is a sought after soloist as well as a dedicated chamber musician. Through active collaborations with composers of all ages her work aims at understanding, examine and realize the ideas behind each score. Karin Hellqvist is a member of several forefront ensembles for new music in Scandinavia such as Cikada, Oslo Sinfonietta, neoN, Faint Noise and Curious Chamber Players. In her solo project she recently commissioned a body of solo works exploring the violin in the company of electronics and various sound objects; paired with flower pots, guitar pedals, street noise, chain saws and synthetic sounds. Regularly invited to renowned scenes for contemporary music she has performed at festivals as Warsaw Autumn, Huddersfield Contemporary Music Festival, Ultima Oslo Contemporary Music Festival, Venezia Biennale, Milano Musica, Ultraschall Berlin, Harvard University, Berliner Philharmonie, Pan Music Festival Seoul and the Summer Course for New Music Darmstadt. In 2016 she received the Interpreter's Prize from the Society of Swedish Composers. Heloisa Amaral (BRA/PT) has studied piano, historical keyboards and conducting in Freiburg (DE) and Oslo (NO). Her early interest for contemporary experimental music has led to collaborations with composers and sound artists such as Helmut Lachenmann, Natasha Barrett, Simon Steen-Andersen, Johannes Kreidler, Øyvind Torvund, Alvin Lucier, Phil Niblock, Jan St Werner or Marina Rosenfeld. A former member of ensemble asamisimasa, Heloisa currently performs both as soloist and chamber musician, with Duo Hellqvist/Amaral (vln/pn), Duo Amaral/Zöllner (acc/pn) and Ensemble neoN. 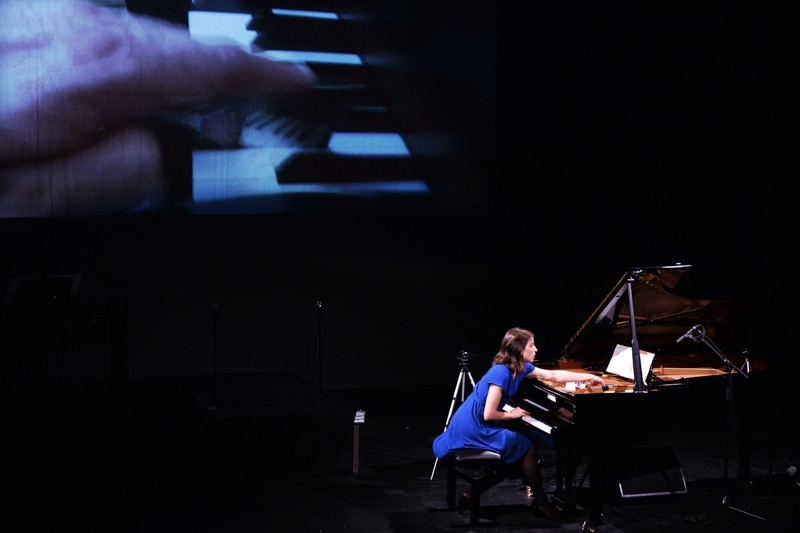 Recent performances (2016) include concerts at ZKM, Casa da Musica, Only Connect, Tschaikovisky Saal Hamburg, Klang Festival, De Bijloke, Mata Festival, KontraKlang and Seoul Arts Center. Recent releases includeNEON at GRAPPA and Lush Laments for Lazy Mammals with Håkon Stene on Hubro/GRAPPA. Upcoming concerts include new commissions by Marina Rosenfeld and Joanna Bailie (WP Only Connect 2018). In addition to her work as a performer, Heloisa is active as teacher, curator and artist-researcher. Between 2011-2012, she curated the concert series of Ny Musikk. From 2012 to15 she was responsible for the program and coordination of the Ultima Academy and other mediation activities at the Oslo Ultima Contemporary Music Festival. In 2016, she was invited to take part as a tutor in the 48th Summer Course for New Music Darmstadt. Currently, Heloisa works as international network manager for the Ultima Festival while at the same time pursuing a PhD in artistic research at the Orpheus Institute (BE) on the topic "More Fetish Objects to Haunts Us - on the use of curatorial strategies in musical performance”.